I never knew about Creaclip until I was sent a sample by the South African distributor. 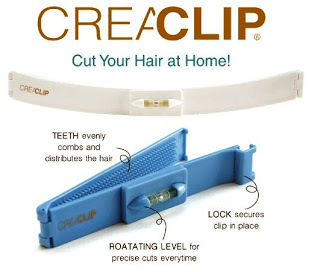 Having a haircut has never been so easy, as it is now with the CreaClip. You can cut fringes, straight lengths, layers, straight bob and A-line bobs. Infact you can cut any style any length and is suitable for both guys and gals. With two daughters, these smalleasy to use gadgets have made it so easy for those quick fixes at rushed moments. You can have a fresh, new look anytime anywhere, with these magic clips and a pair of scissors. Plus think of all the money you'll be saving. Get the look you want exactly, with the CreaClip. For someone that hasn't cut anybody's hair before, the first thing I did when i got my CreaClip was to checkout the dvd. It was awsome and made it look so easy that I had to try it out. Since my hair is already short I used it to trim my mum's mane. And yes, unbelievably it was as easy as it looked. All you have to do is put the hair into the clip, slide it down to where you want to cut off the hair and keep the water bubble in the middle and snip, snip, snip......As easy as that! For mums its a must-have, for those monthly trims for the kids. And when you find out the price, you will definiately be amazed. I found the CreaClip on facebook, on Magichair the South African distributor for Creaclip. Check them out on www.creaclip,co.za or mail them on info@creaclip.co.za, for more info or to order you Crea clip.